Process model management consists of several phases within the process management life-cycle, starting with the design of processes. This requires the explicit representation of activities, temporal and hierarchical dependencies between activities, as well as the modeling of domain knowledge. These process models are initially described at a level of coarse granularity and then specialized or refined into a more specific model. Given two process models, it is a challenging task to decide whether one process model is a valid specialization of the other, more abstract model. A further aspect in process model management is the configuration of process models. A process model is adapted and configured according to individual requirements. 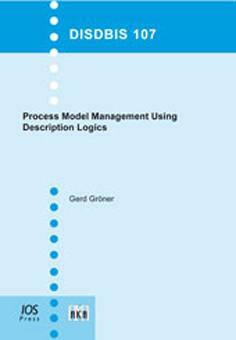 We present novel contributions to several phases of process model management. We use Description Logics as a formalism to describe process models and their semantics. As a starting point, we present a pattern-oriented approach for expressive process modeling in Description Logics. We build upon our process model representation and apply reasoning services for process model retrieval. Process model retrieval is based on the control flow characteristics. Reasoning services are used for the validation of process model specializations. We describe existing specialization principles and their semantics in Description Logics and check the validity of process model specializations with respect to these principles. We address process model configurations by means of families of processes. Finally, process model changes are analyzed with respect to certain kinds of changes called refactorings, which only change the process model structure. We handle process model refactoring by a generic approach, which relies on comparison methods within the underlying Description Logic knowledge base.